Ladies, this is the tea for you! Black Cohosh tea may just be what you need to help deal with hormonal problems. Be it menopause or not, this is the tea to deal with the discomfort you are feeling. So, don’t miss this opportunity to learn more about and purchase a tea that will help you through these difficult days. In Latin, Black Cohosh is known as both actaea racemosa and cimicifuga racemosa. Both designations are valid, but the former is the currently more accepted one. This flowering plant is native to North America, mainly in eastern Canada and eastern US, where it can be found growing in woodlands. With tall stems and a long root system (rhizomes can be as long as 25-60cm or 9.8–24in). With large green leaves this perennial plant blooms in late spring and early summer, filling its tall stem with white flowers, which give off a sweet smell that attracts insects. You may also find it under many other common names, such as squaw root, rattle root, snake root, baneberry, black snakeroot, bugbane and bug wort. Most of these names are the result of the historical use given to black cohosh root. Native Americans used this herb for treating many ailments, from gynecological problems, to sore throats, kidney issues, depression, snake bites and even joint problems. When European settlers came to the American continent, they too started to use the black cohosh root medicinally. Thus this tea became increasingly famous in the 19th century for treating rheumatism and nervous disorders. Today black cohosh tea is a beverage that is mainly used to help with PMS, menopausal and other gynecological issues. Find out next what makes this tea so special and a wonderful home remedy. This herb is rich in vitamins A, B1, B2, B3, C and K; and minerals such as calcium, iron, magnesium, potassium, sodium, zinc and many others. It also contains actein, salicylic acid and tannins. All these constituents work together to bring you tea that is full of benefits. This tea is gaining a great deal of reputation for bringing menopausal relief. This is the direct result of black cohosh acting as a liver cleanser. By keeping your liver healthy, it keeps your hormonal levels in check. It is especially helpful for hormone replacement therapy. A cup of black cohosh tea helps to stimulate your estrogen levels, helping you deal with the symptoms of menopause such as hot flashes, mood swings, depression and vaginal dryness. As an adrenal tonic, it fights the stress that your adrenal glands are subjected to and that causes the symptoms of menopause to disturb your days and your nights. Another one of the great benefits of black cohosh is the fact that it may help to slow down the process of bone loss, preventing osteoporosis, a condition that is common during menopause. Stressed over a delayed period? Well, stress is not going to help you, but a cup of black cohosh tea just might. It is a great uterine tonic that will help you regulate your periods, bringing on delayed or absent menstruation and relieving the pain that comes with it. As a muscle relaxant and a nerve tonic, it helps to deal with PMS symptoms, relieving stress and nervous tension that naturally occurs at this time. You may also find relief from nausea, depression, mood changes, bad headaches, acne and excessive hair growth. So take a cup of this tea for both high and low estrogen levels. Keeping the liver cleansed is a great benefit of black cohosh, so why not try it next time you need a little help? By reducing inflammation, black cohosh tea is great to bring relief for rheumatic pain and prevent arthritis. Great for elderly who might be suffering from joint pain. It relieves muscle tension and spasms; reduces the pain and improves blood flow which helps your body get rid of the toxins that are causing the inflammation in the first place. This natural sedative and painkiller is the perfect cup of tea to treat a headache that is bothering you. This tea is also great to help you reduce the levels of bad cholesterol and harden your arteries. In Chinese medicine, it is use to bring relief to asthma attacks and helping to clear mucous from your nasal passages. However, it is not only in China that black cohosh is used to treat cold symptoms, around the world people drink it to fight coughs as it is a mild expectorant. A final benefit that may come from drinking this tea is that it stimulates your uterus to contract, meaning that drinking this tea during the final stages of a pregnancy help to push an overdue baby along. However, do not do this without consulting your doctor or the side effects section below. Before brewing a cup of this tea, let’s take a look at the side effects that may occur. This herb makes quite a powerful tea, so you should keep to low doses, always staying within the recommended amounts. Too much black cohosh tea may cause headaches, instead of relieving them, nausea and, in extreme cases, tremors. For some, too much may cause diarrhea, vomiting, dizziness, sweating and drops in blood pressure. Do not take this tea on a daily basis. It is best to drink it moderately and for short periods of time. If the pain or symptoms last longer, go see your doctor, just to make sure if everything is okay. This tea is a uterine stimulant and this is the reason why this tea is great to bring on menstruation. However, this is also why you should not drink it while pregnant or breastfeeding. If you choose to drink this tea at the end of your pregnancy, always do it with the supervision of your doctor. Because black cohosh tea affects your estrogen levels, it should not be taken with menopausal medications or supplements without speaking to your doctor first. Have him or her monitor your symptoms so that you can adjust your medication accordingly. Though further studies are still needed, it is recommended that if you have a history of breast cancer or liver disease not to drink this tea. Side effects have not yet been completely proven to occur, but still it is better to play it safe. Because of the effects on your hormone level, best not to drink this tea while on birth control pills, as it may impair their results. So finally, here we are, ready to learn how to make black cohosh tea. The parts used to make this tea are the thick and knotty black cohosh roots. You can find black cohosh dried leaves, roots, in cut or powdered form, loose or in teabags. To make this tea for medicinal purposes, boil 1 teaspoon of black cohosh per cup of water for about 20 – 30 minutes. This makes a dark and rather bitter tasting tea that can be sweetened with sugar or honey. Alternatively, for your drinking pleasure, you can place 1 teaspoon of black cohosh root in one cup of boiling water and let it steep for about 3 minutes. Sweeten it to your liking. This will make a milder, yellow tea than the above suggested recipe. Drink 2 to 3 cups a day. Be sure to stay within the recommended doses. If any discomfort occurs, speak to your doctor immediately. Here is a suggestion you may enjoy. For further relief of your menopausal discomfort, try blending black cohosh with St. John’s Wort for a relaxing and tension relieving tea. Buy Your Black Cohosh Tea Today! 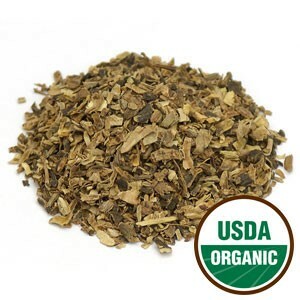 Click on the image or on the link below to purchase from Starwest Botanicals your Organic Black Cohosh Root. Make your black cohosh tea with organic cut or powdered root and enjoy a cup of tea that is both warming and comforting. Do not let another restless night keep you from getting your much deserved rest.